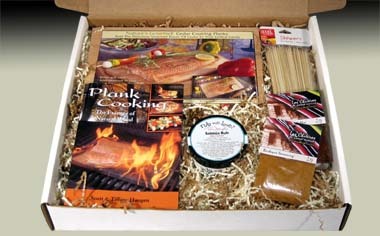 Nature's Gourmet™ Gift Boxes are great for Cedar Plank Cooking beginners, novices and enthusiasts alike. Plank Cooking has become a very popular way of preparing all types of food. You see articles in cooking magazines, demonstrations on cooking shows and Cedar Planked Salmon on more and more restaurant menus. A Nature's Gourmet™ Gift Box is an excellent way to get started experiencing the great gourmet taste of cedar right in your own home. Each gift box includes 3 Cedar Cooking Planks, the Plank Cooking cookbook by Scott and Tiffany Haugen, Salmon Rub from Seattle Restauranteur Tom Douglas, seasonings for your fish or meat from Los Chileros and plenty of skewers for your accompanying veggies. The Plank Cooking cookbook has over 100 plank cooking recipes, illustrated with beautiful photos, for everything from appetizers to deserts. All you need to do is Add The Food. There are additional recipes and tips here on our website. A Nature's Gourmet™ Gift Box makes a perfect gift for any occasion: Father's Day, Birthdays, Holidays, House Warming, Mother's Day, Anniversaries, Weddings, Graduation, Fourth of July and Labor Day parties, etc. It doesn't even have to be a special occasion. If you have never eaten fish, meat or veggies cooked on a cedar cooking plank, you're in for a treat, our gift box provides everything you need to get started cooking with cedar, you Just Add the Food. If you have, a gift box is a great way to share the experienced and Great Taste of Cedar Plank Cooking with friends, family and business associates. For more information on how to order, call 866-522-3093 or click here to contact us. These Gift Boxes are only available as a special order of 50 or more. Please call or email for details. Note: Some items in the boxes may be slightly different. If you have a question about a specific item, please contact us. 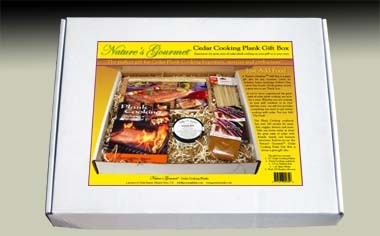 All boxes always come with genuine Nature's Gourmet™ Cedar Cooking Planks. Additional Nature's Gourmet™ Cedar Planks can be purchased online, at your local Ace Hardware, True Value, Santa Monica Seafood, OC BBQ Galore and other stores. Always insist on genuine Nature's Gourmet™ Cedar Cooking Planks to get the very best taste sensation and results.